I could probably count the number of hours I’ve slept in this past week on one hand. It’s been a week of papers and tests and craziness, but it’s finally, finally over! So a couple of weeks ago, it was my friend AGlase’s birthday. My friends and I went all-out with a fancy dinner party. In some ways, this meal was the calm before the storm. It started with a flurry – a 5-page paper due the Friday after her birthday. It then escalated into a hurricane made up of two midterms and two papers, keeping me busy until last night when I clicked ‘send’ on the final paper. But honestly, despite the slightly alarming fact that my body actually doesn’t know when meal time and sleep time is anymore, it was a memorable week, in a frenzied way. There were days when I holed up in my room and wrote like a fiend, others when we had group study sessions that were…special in their own way. There was a surprising amount of laughter in there, even if it bordered on maniacal. I’m glad it’s over now, and I’m looking forward to a weekend of real sleep instead of fitful, twenty-minute naps. I’m looking forward to breaking out the pie tin and baking pumpkin pie using real pumpkins! Now excuse me while I go crash and pass out for twenty hours. 1. Warm the chicken broth in a saucepan over low heat. 2. Clean and trim the mushrooms. Remove the stalks from any capped mushrooms and toss them into the stock to infuse the broth. Slice any capped mushrooms and cute the rest of the mushrooms into halves or quarters (1/2″-1″ pieces). 3. In a large pot, heat 2 tbsp of butter and the olive oil over medium-high heat. Stir in the mushrooms and cook until browned, 3-5 minutes, being sure not to crowd the bottom of the pot. Salt and pepper the mushrooms to taste (err on less salty because the chicken broth is pretty salty). 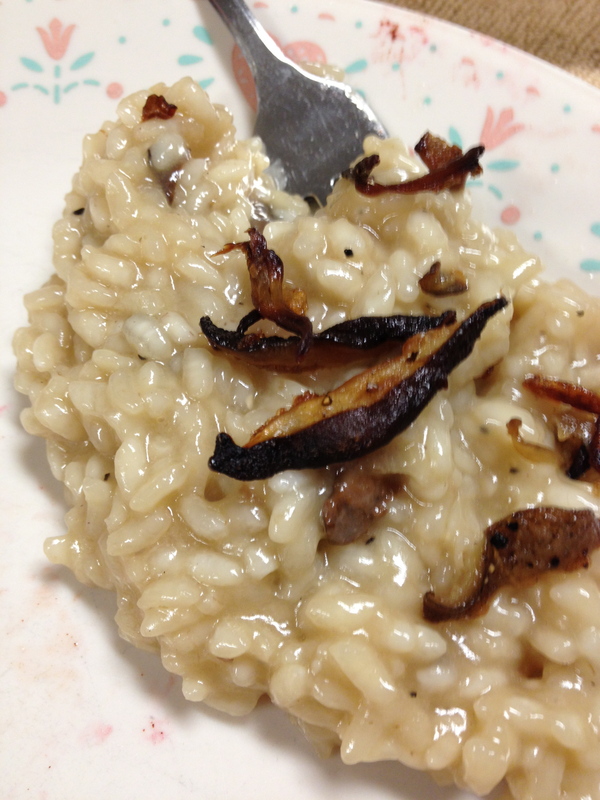 Remove 1/3-1/2 of the cooked mushrooms to garnish the risotto when it’s done cooking. 4. Lower heat to medium-low and add the rest of the butter and minced shallot. Cook for 1-2 minutes. Add the rice to the pot and stir, coating each grain with butter and oil and impregnating each grain with fats. When the rice starts to look translucent, add the white win and cook, stirring constantly, until the wine is fully absorbed. 5. Add 1/2 cup broth to the rice and stir until the liquid is absorbed. Add another 1/2 cup of broth and continue to cook, stirring, until the broth is absorbed. Continue adding broth and stirring until rice is al dente. Start tasting the rice when about 2/3 of the broth has been added. The process should take 20-30 minutes. 6. When the risotto is the desired texture, remove it from the heat and stir in the parmesan. Taste for seasoning and add salt and pepper as desired. 7. Warm the reserved mushrooms in a small skillet over low heat. Serve the risotto in bowls with extra grated parmesan, reserved mushrooms, and a sprinkling of chopped parsley.